Higanbana, the spider lily, is one of the sign of the arrival of Autumn. It always blooms during the autumnal equinox, and colors the ground a beautiful red. How about enjoy Higanbana in Kanto for the end of Summer and beginning of Autumn. 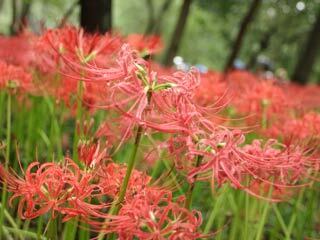 Kinchakuda (巾着田) is the most famous Higanbana, red spider lily, in Kanto. It is located Hidaka city, Saitama prefecture. There are one million Hibanbana in this park. Higanbana bloom around the Autumn Equinox. During the season, all the garden of Higanbana become the beautiful red carpet. During the season, there are food stands which sale tasty local products.